Acrylic, photocollage, and resin on wood panel, 84 x 72 in. 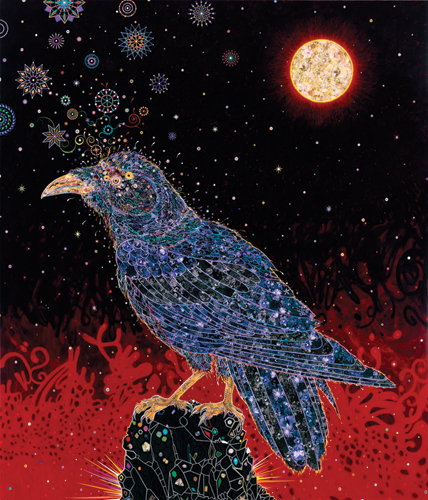 Fred Tomaselli is an American painter from California. He has exhibited in both group and solo shows across the country. I saw one of his works at the Virginia Museum of Fine Art. It captured me from far away with the large painting of a bird, rendered with bright color against a plain black background. Tomaselli's painting then surprised me by being even more interesting close up. Acrylic, gouache, photo collage, resin on wood panel. Also, I'll throw in a great video of Fred Tomaselli explaining what he does.